Looking for short reads in #horror this summer/winter. Great for fans of Dean Koontz and Stephen King. I have to admit, I grew up reading fairy tales, those wonderfully dark stories about evil witches, enchanted forests, and mean dwarves who stole children. Rumplestiltskin is still my all-time favourite fairy tale. Remember the TV series "Once Upon A time"? I was a fan of the character. R. L Stine's "Goosebumps" books were something I started reading when I was much older, simply because they weren't around when I was a child. But I adore a good ghost story. So I guess it's not hard to see why I'm writing my very own "Goosebumps" for adults series of horror and supernatural thrillers called "The Shivers Novellas". Standalone titles that can be read in any order. Each is 30,000 words or 109 pages, so they can be read on the bus or at lunch. This series will suit readers who are strapped for time but don't want to miss out on reading a book. 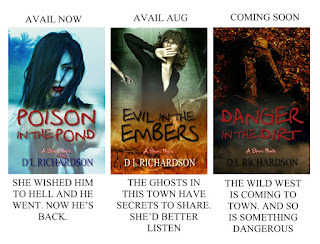 "Poison in the Pond" is the first book in the series and it's been a good seller on Amazon. Now avail on B&N, Kobo, and other online retail sites. All of these books will be avail in print. 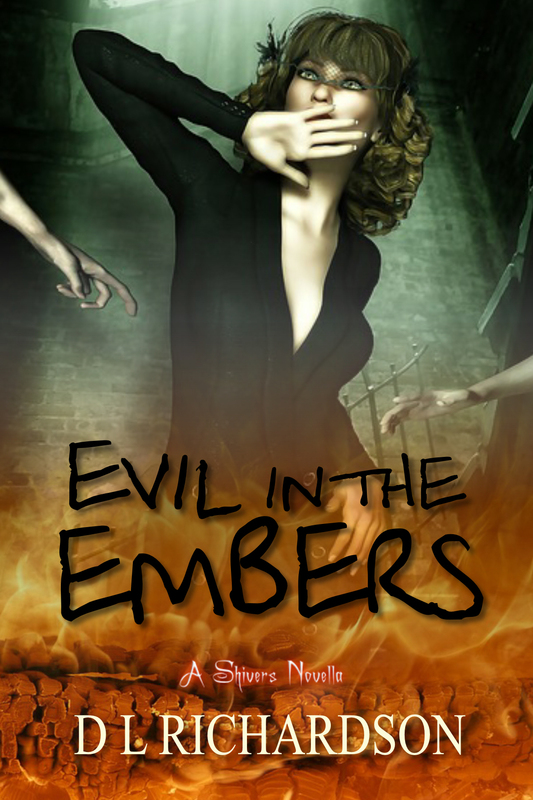 "Evil in the Embers" is the second book and it's officially released on August 20. 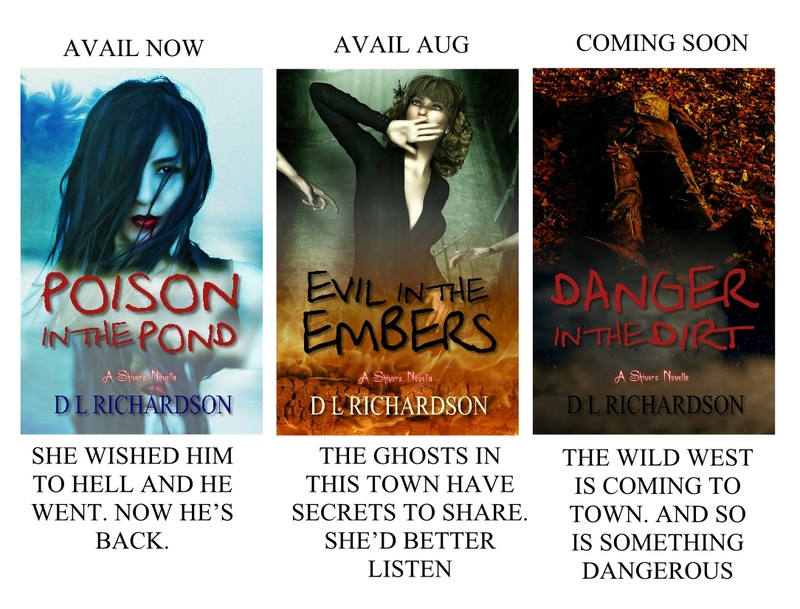 "Danger in the Dirt" is the next in the series and this story will blend the wild-west with a mythological beast. Evil will be unleashed and it wants revenge. Please note this is unedited and not the final version. Fifteen years was a long time to stay away from a place you told your friends stories about. Whenever Jenny Abercrombie spoke of Horseshoe Bay, in her mind she pictured the wind as it whipped the reeds on the lake, seagulls bobbing on the water despite being miles away from the ocean, traffic pulled over at the side of the road to take photos of the mountains. Even now her mouth watered for the taste of peppermint ice cream with sprinkles from the soda shop, a relic from the past that the townsfolk believed would be their downfall if it were to ever close. It seemed a betrayal somehow that she'd last visited Horseshoe Bay...how many years? It had to be fifteen. How much would it have changed? she wondered as she steered her Honda onto the road leading to the picturesque lake town where she'd spent every summer between the ages of four and sixteen. Whenever she spoke of Horseshoe Bay, she also pictured her father's hands on the wheel of their dark-blue station wagon. For years their mother had sat in the front, while Jenny's older sister, Carrie, had sat in the back, wedged between suitcases packed with items they'd never use. The bags were often just a buffer to stop the girls fighting. Lately, these memories ended with stabbing pains to Jenny's chest. Her parents had divorced bitterly when she was ten, and her father had taken the two girls on his own for the next few years, but it was never the same. For a start, Carrie had taken the front seat, her smile wide like the proud winner at a pie eating contest, and Jenny had sat in the back alone with their suitcases. The roads had improved. She remembered her father having to dodge pot holes on his way in. Sometimes when Carrie became annoyingly obnoxious, Dad would aim for a pot hole, then he'd wink at Jenny in the rearview mirror and she'd feel ten-feet tall. The sign welcoming her to Horseshoe Bay had had a facelift - gone was the photos of the lonely cabin, now replaced with pictures of fishing and water skiing on the lake. The trees she remembered as being tall enough to take her up to the clouds were ordinary poplars, fully grown and adorned with the bright green foliage of spring. She pulled over to the side of the road to stare down Main Street. It was familiar, yet as if Mother Nature had never dusted the town and it now sat heavy with a smear. So much could have changed and she wouldn't have known. She felt the stab of betrayal once more as she drove onwards to the Mayflower Inn. Chance had led her to book this particular inn. Curiosity had led her to discovering that it was operated by Troy Dillon, her childhood summer crush. Hadn't he once told her that he loathed this town and he was getting out first chance? If he had left, it seemed like destiny that he should be here when she finally returned. Three years old than Jenny, he'd be thirty-four by now. What did he look like? she wondered. As a photographer, Jenny spent a lot of her days picturing things in her mind. Sometimes she wondered why she needed a camera at all. But then she couldn't project her mind onto the page. At first she'd use the camera to mask her shyness. Then she'd come to love it. And she was good enough to earn an income. A small income. One that unfortunately didn't provide enough cash to replace her car. So the advertisement for a photo contest with a car as first prize was enough of a lure to drag her back to Horseshoe Bay. Jenny conjured up images of Troy Dillon as the tanned, golden-haired sixteen-year-old boy she'd followed every summer like a lost puppy. The awkward, teenage nervousness she'd suffered in puberty was returning. She almost forgot that she needed gas. She pulled into the service station. An amendment to the original location; she remembered it being a little further down the road. She hesitated before getting out of the car. Pulling a photo album out from her bag, she checked to make sure her memory was working. Yes, the service station used to be further down the road and painted blue. Checking to make sure she wasn't holding up anyone else who wanted gas, she grabbed her camera and got out, then she walked to the sidewalk and stared up and down the road. She snapped a few photos to compare photos she'd taken in her youth to these. Her project was going to be either a series of comparative photos or a single photo of old versus new. She wouldn't be sure which photos she'd enter until she'd spent time studying every detail with the eye of a beauty pageant mom. She fueled up and headed further into town. Now trepidation and fear began to settle in. Sometimes the past belonged in the past, and to resurrect it might bring on the same disastrous consequences as resurrecting a corpse. Which, she told herself, was the most random thought of the day and belonged in a horror movie.